Do you judge a book by it's cover? I think I don't, but I probably don't bother to pick up a book that has an ugly cover or displeasing image on the cover. But what appeals to me might not appeal to someone else. I have a new series of books I'm working on that I call my Front Porch Promises series. These are the covers for the first two books. My cover designer found the image for the first book. I found the image for the second one by searching endless pictures of front porches. 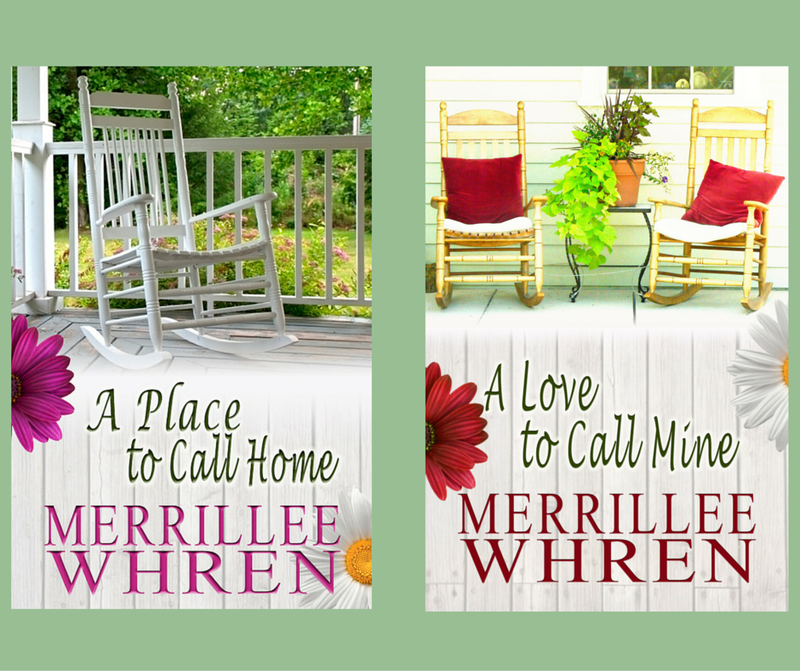 For the third book that is titled, A Family to Call Ours, I want a cover with two adult chairs and a child's chair because my heroine is a single mom. Again, I have searched and searched through photos of front porches, and I have only found one image that has two adult chairs and a child's chair. I can't show you the image because I don't have the rights to it. Besides, it is a drab picture that doesn't give the hopeful message that I want for the cover. Because I've been unsuccessful finding a photo I can use, I kept thinking about using one of my own. Unfortunately, I didn't have any photos that fit the description. Could I take one? Not easily. I live in southern Arizona where the houses are mostly adobe or stucco with tile roofs. Where was I going to find a house with a nice front porch? We recently took a trip back to Florida where we used to live. I knew there were lots of houses with front porches in the area. On our last day there, I drove around looking in neighborhoods for the perfect front porch. Did I find one? You be the judge. Both photos have their problems. The first one isn't quite right because of the shadows and sun. 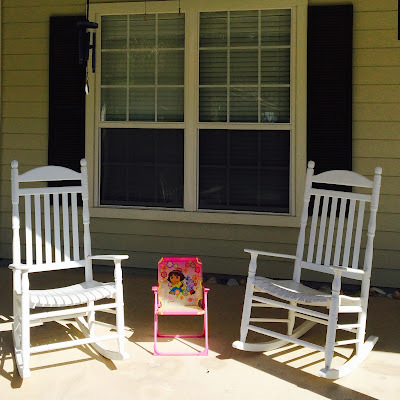 While I was off trying to find a child's chair, the sun crept into the porch on this side. In the second photo, you can see my reflection in the door as well as the reflection of the small chair. Can my cover designer fix the problems and still use the photos? That remains to be seen. 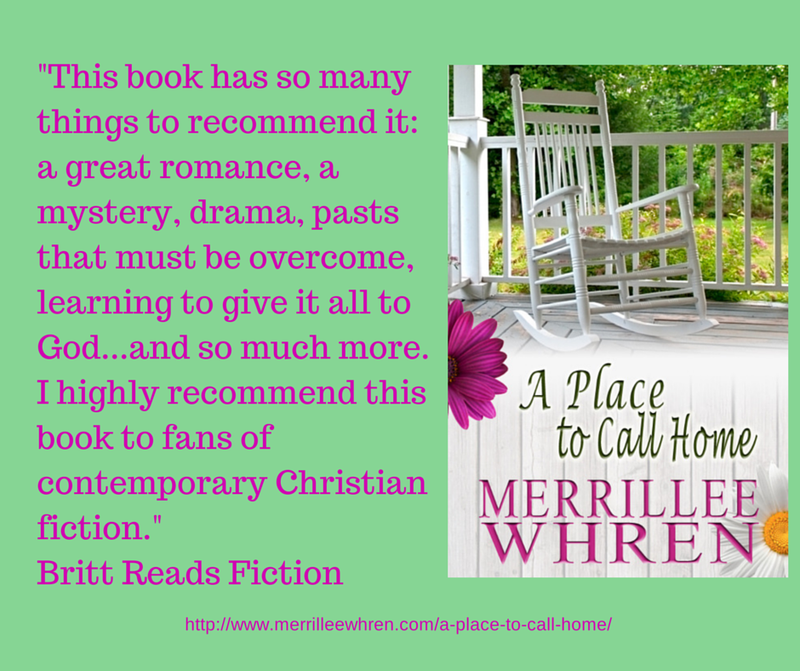 I will be giving away a copy of the first book in the series, A Place to Call Home, to one person who leaves a comment. The winner's name will be drawn on April 15, 2016. Personally, I prefer the second photo. 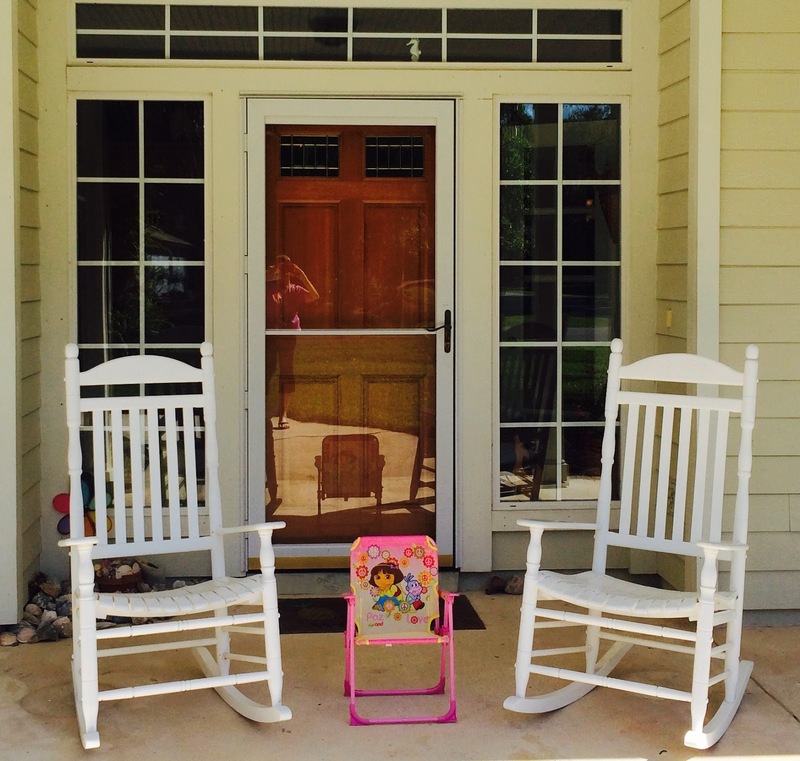 The front door projects a warm and welcoming image, so I hope that the reflections and perhaps also the pile of "stuff" behind the chair on the left can be edited out. Mary, thanks for stopping by. The stuff behind the chair are shells. I, too, prefer the second picture. With all of the options now available for online photo editing, I'm sure that something could be done about the flaws. Laurel, glad you dropped by. I'm hoping that the flaws can be edited out, too. I like the first one. It has its own natural beauty and that white rocking chair is more inviting to me as one, as opposed to two chairs.. That's just me.. I like the first one because if you are sitting in the chairs relaxing, you won't be blocking the door and have to get up if someone comes up. Yes, I think having chairs in front of the door isn't the natural setting, but I was trying to pick up any angle. I think the first one is more of a practical arrangement on a porch. You agree with Ann about the arrangement being better not in front of the door. I personally like the first picture myself. I'm wondering if your cover designer can make the child's chair plain? I think the picture fits in more with the first two books. No need to enter me! 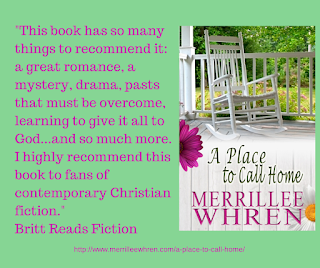 I've already read & enjoyed "A Place to Call Home", probably one of my favorites this year. I read it in ONE day,it was that good! I agree that both have merits and flaws. No need to enter me in drawing,I read and reviewed this wonderful book that gives you romance, suspense and second chances. Thanks, Linda, for stopping by to leave a comment. I like the first photo. It seems less busy so your eyes are drawn to the chairs. Lori, I see what you mean when I look at it a second time. Lots of window panes in the second photo. Debbie, that would be the plan. I like the first one BECAUSE of the shadows. It speaks peaceful relaxation at the end of the day. Peggy, I'll have to see what my cover designer has to say. She'll know what works for the cover. I love the porch concept as I love front porches. Sadly I don't have one but always admire the ones I pass. Yours are very cute! We've had just one house with a front porch unless you count the one we rented when we first got married. Hmm, I actually like the first one. It looks more natural (less staged). Would be weird sitting in the second one with people coming in and out the door. Jen, you have a good point. Deanna, the reflection is a problem unless the photo can be touched up to get rid of it. I'm not a photographer, so I didn't notice that while I was taking the photo. I'm sure a real photographer would have seen that. I like the first one better. My grandparents had a house like this and had rocking chairs on each end of the porch in front of the Windows like they. To me the chairs in front of the door don't look as natural. But that's just my opinion, what I was use to seeing!